The nutrition that small- and medium-sized breeds of dogs need is different from that for large and giant breeds. 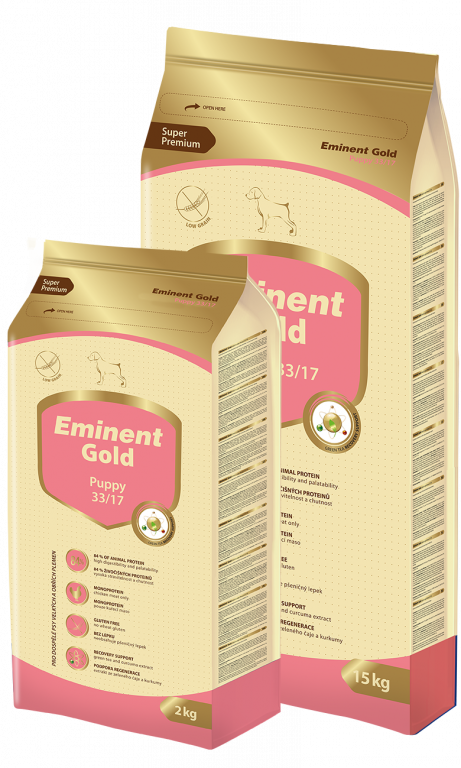 The essential need for the quality, easily digestible proteins that are so important for the proper growth and development of a puppy’s body are covered by our foods’ high content of chicken and hydrolyzed liver. Amaranth and buckwheat, ancient gluten-free crops, together with MOS and FOS, help to keep the digestive tract, cardiovascular system and liver all working properly. This means your puppy is full of energy and in excellent condition. 410 g of poultry meal in 1 kg of food corresponds to 1 500 g of raw meat. Ingredients: dehydrated chicken meat (41 %), rice, maize, poultry fat, peas, hydrolyzed poultry liver, amaranth, buckwheat, apples, flaxseed, fish oil, coconut oil, milk thistle seeds, chia seeds, MOS (mannanoligosaccharides), FOS (fructooligosaccharides), beta-glucans, green tea extract, curcuma extract, glucosamine, MSM (methylsulfonylmethane), chondroitin sulfate, rosemary extract, additives (vitamins, trace elements, amino acids).